Lanthanides are transition elements in the 5F block ([Xe]6f24dn) that get their terminology from Lanthanum (and are consequently additionally called the Lanthanoid Series) that have been marked as "rare earth metals" however late logical discoveries have come to debate their irregularity. The arrangement of all elements depends on the electronic configuration of the elements and the "long form" of the Periodic table or the Modern Periodic table is planned to remember this component. Likewise, the elements in which the f-block is getting filled are kept at the base segment of the periodic table and are called f-block elements or Lanthanides in the sixth period and a fragmented seventh period called Actinides. The lanthanides are a series of fifteen metal elements that are beside each other close to the base of the periodic table. The name of the series originates from lanthanum, the element that denotes the start of the series. All individuals from the series have comparative chemical properties. In nature, they are discovered together in similar minerals and it is hard to separate them into individual elements. Lanthanides can be characterized as those elements in which the 4f-block gets filled progressively from 4f1 (Cerium) to 4f14 (Lutetium) where the filling up of electrons occur at n-2 circle (second orbit beneath the peripheral orbit). Lanthanides have the strange component of having practically comparable properties. They were at first known as rare earth metals, however, now they are for the most part named as inner transition elements. An optional term for lanthanide is "rare earth". The word earth, once utilized by scientific experts for compounds, is currently called oxides. A compound is shaped when particles of various elements bond together amid a chemical reaction. Rare earth was the term utilized for the oxides of lanthanide elements to recognize them from better-known earth. The properties of Lanthanides can be arranged as General (Physical) and Chemical Properties. 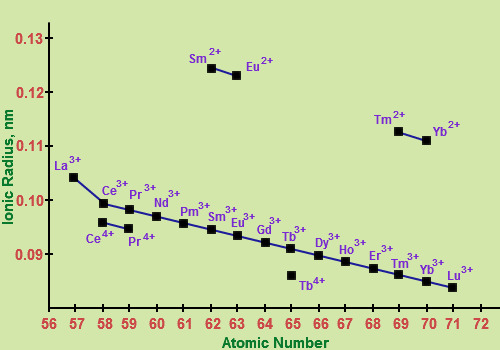 Atomic and ionic radii: The nuclear and ionic radii of the tripositive and tetra positive actinoid particles there is a relentless decline in the ionic sizes of the tripositive and tetra positive particles. This might be alluded to as lanthanoid constriction. Because of the poor protecting by the 5f electrons. Electronic Configuration of Lanthanides: All having electronic configuration with 6s2 is normal yet variation in occupancy of 4f and 5d-subshells is seen because of the closeness in energy of 4f and 5d electrons. So it is viewed as that the 5d orbital stays empty and the electrons go into the 4f orbital. Special case are on account of gadolinium, Gd (Z = 64) where the electron enters the 5d orbital because of the nearness of half filled d-orbital and in Ytterbium (z = 70) in which all the 4f orbital's are totally filled and the separating electron of the following element that is lutetium (z = 71) enters the 5d orbital. The total electronic configuration of Lanthanides can be given as 1s2 2s2 p63s2p6d104s2p6d10f0-14 5s2p6 d0-1 6s2. Oxidation States: Lanthanides demonstrate variable oxidation states. The most stable oxidation condition of Lanthanides is +3. They likewise demonstrate +2 and +4 oxidation states because of the nearness of either half filled or totally filled or vacant 4f sub shell. Color: A large portion of lanthanide metals is silver white. The lanthanide particles with +3 oxidation state are shaded both in aqueous solution and solid form. The shade of a cation relies on upon the number of unpaired f electrons. Magnetic Properties: The lanthanide particles other than f0 and f14 sort are paramagnetic in nature because of unpaired electrons in f-orbitals. Melting and boiling point: They have genuinely high melting point, yet there is no distinct pattern in the melting and boiling point of lanthanides. Density: They have high thickness running between 6.77 to 9.74 g cm-3. It increments with expanding nuclear number. Ionization enthalpies: They have low ionization enthalpy. Complex formation: They don't tend to frame complexes as a result of low charge density. The order of complex development can be best spoken to asLn4+ > Ln3+ > Ln2+. Reactivity: Every one of the lanthanides demonstrates the same electronic configuration and the +3 oxidation states; they indicate comparability in the reactivity which is more prominent than the transition elements. This is because of protecting of the unpaired electrons of the internal 4f-orbital by the external 5s, 5p, and 5d orbitals. Because of the little change in the extent of the particles, they demonstrate extraordinary likeness in their chemical properties. An initial couple of membersare very reactive. A couple of properties are given underneath. All lanthanides react quickly upon introduction to air. They break up in high temp water and react with acid, releasing hydrogen. They frame the nitrides and hydrides subsequent to reacting with nitrogen and hydrogen individually. They likewise react with non-metals like halogens, sulfur, phosphorus, carbon and silicon and frame their comparing compounds. The +3 lanthanide compounds are a great deal more reactive than Aluminum compounds however marginally more reactive than Magnesium compounds (allude to the anode potentials). They react gradually with chilly water however quickly with boiling point water. Hydroxides are precipitated by ammonia as thick precipitates. They are less fundamental than Ca(OH)2 however more essential than Al(OH)3. Above 300 – 400°c lanthanides react with hydrogen to shape strong hydrides. These hydrides have a non stoichiometric recipe with 2H-particles while the metal is in +3 state. Yb frames roughly YbH2.5 hydride. Lanthanides stain promptly in air, shaping oxides. On warming with oxygen likewise they shape the oxide M2O3. Ce is a special case and structures CeO2. Anhydrous halides are made by warming metal and halogen or on the other hand, by warming oxide with the fitting ammonium halide. Hydrated lanthanum chloride on warming separates into Lanthanum oxychloride with exhaust of water and HCl. 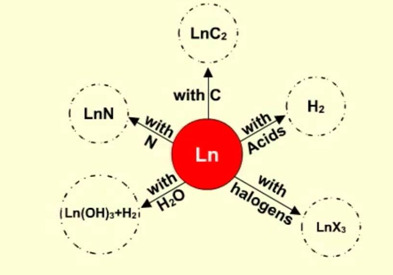 On circular segment melting metal with carbon in inactive air, metal carbide is shaped which has one electron in the conduction band with equation LnC2 and Ln4(C2)3. These carbides with water create acetylene and henceforth are called acetylides. At high temperatures lanthanides react with N, P, As, Sb. Like AlN, these nitrides likewise give ammonia on getting wet with water. Lanthanides additionally shape a wide assortment of oxo salts with nitrates, sulfates phosphates. The nuclear size or ionic radii of tri positive lanthanide particles demonstrate a stable and progressive decline with the expansion in nuclear number from La to Lu. In spite of the fact that they demonstrate a few anomalies, the ionic radii diminish relentlessly from La to Lu. 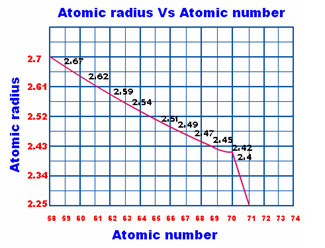 This slow decrease in the size with expanding nuclear number is called Lanthanide Contraction. The significant reason for lanthanide withdrawal is because of the unseemly shielding of the 4f electrons because of the inappropriate state of the f-orbitals. As the nuclear number increments in the lanthanide series, for each proton in the nucleus the additional electron goes to fill the 4f-orbitals. This outcomes in gradual reduction in the size of lanthanides with expanding nuclear number. The lessening in size is not consistent all through the lanthanides. A quick decrease is seen just in the initial six elements contrasted with whatever is left of the elements. Similarity of second and third transition series- By and large the atom's size increments down a group. So the measure of the molecules of an element of second transition series is bigger than any particle of the primary transition series yet the size of the atom of third transition series is almost same as that of the molecule of the second transition series. The comparability in the size of particles of the elements having a place with a similar group of the second and third transition series is because of the impact of lanthanide contraction. For instance radius of Zr, radius of Hf, and radius of Nb, radius of Ta, and so forth. Fig. 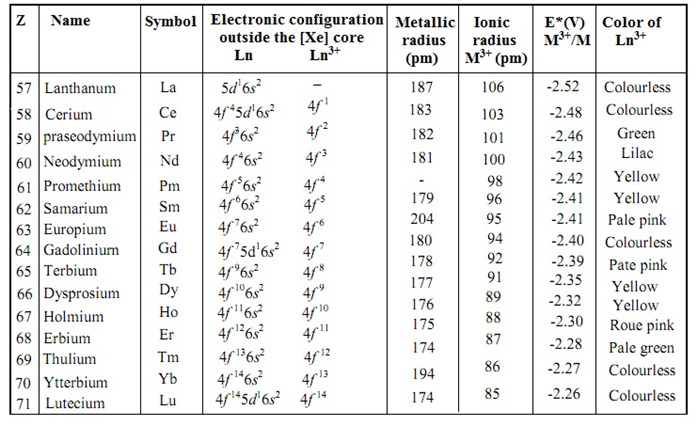 8: The third-row transition metals possess relatively small covalent radii due to the "Lanthanide Contraction." 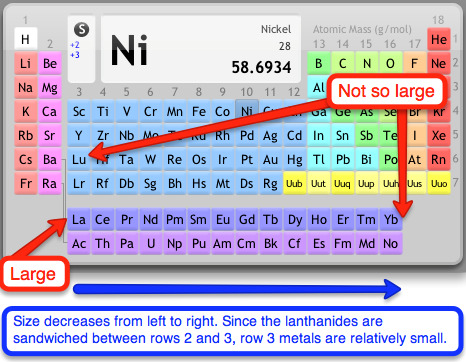 Difficulty in the separation of lanthanides- As there is little change in the ionic radii of lanthanides so their chemical properties are comparative. This makes the partition of elements in the pure state troublesome. This contraction has the slight effect in size so the properties like dissolvability, complex development, hydration and so on demonstrates a few contrasts and it is conceivable to separate them by ion exchange techniques. 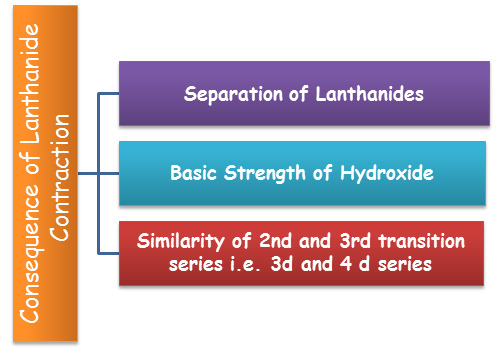 Effect on the basic strength of hydroxides- As the span of lanthanides declines from La to Lu, the covalent character of the hydroxides increments and henceforth their basic strength reduces. Hence, La(OH)3 is more basic than Lu(OH)3. Monazite sand is a wellspring of lighter lanthanides in their trivalent phosphate frame. 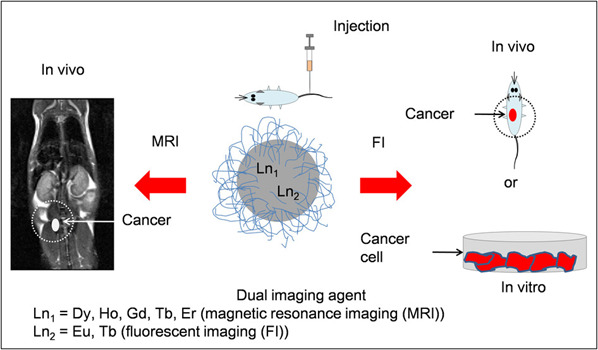 The use of Lanthanide elements as organic tracers is utilized to follow the viability and target course of medications in people and animals. As their pinnacles are thin and extremely trademark, they can be effectively followed in the framework by spectroscopy. Many lanthanides indicate fluoresce in Ultraviolet radiation, which is utilized to concentrate the deformities in metals and so forth. Lanthanides are strong reducing agents and are likewise utilized as impetuses. Lanthanides are utilized as a part of lights, lasers and in projector lighting. Cigarette lighter stones are made out of an uncommon combination of lighter lanthanides and are known as Misch Metal. They are additionally utilized as a part of X-ray, and center lights. 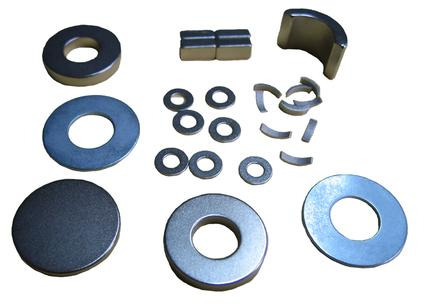 Because of its magnetic qualities, the lanthanides are utilized to make magnets. Thus, Lanthanides find broad use in different mechanical and research applications. Q1: What are the uses of lanthanides? Q2. What is a lanthanide on the periodic table? Sol. Lanthanides can be characterized as those elements in which the 4f-block gets filled progressively from 4f1 (Cerium) to 4f14 (Lutetium) where the filling up of electrons occur at n-2 circle (second orbit beneath the peripheral orbit). Q3. Are the Lanthanoids radioactive? Sol. 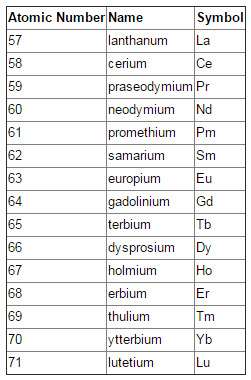 The 14 elements (numbers 58 to 71) of the lanthanide series are otherwise called the rare earth elements. Most lanthanides are framed when uranium and plutonium experience atomic reactions. Nuclear bombs charged of plutonium (actinoid) were utilized as a part of World War II. Plutonium was a source of power for Voyager shuttles propelled in 1977 and is additionally utilized as a part of artificial heart pacemakers. Q4. What are the characteristics of lanthanides? Sol: The science of the lanthanides contrasts from principle group elements and transition metals due to the way of the 4f orbitals. These orbitals are "buried" inside the particle and are protected from the atom's surroundings by the 4d and 5p electrons. As a result, the science of the elements is to a great extent controlled by their size, which diminishes bit by bit with expanding nuclear number. This process is known as the lanthanide contraction. All the lanthanide elements show the oxidation state +3.